CO2 emissions from transport in the EU increased by 41 % between 1985 and 1996. If this trend persists, it will jeopardise the EU meeting its targets under the Kyoto Protocol. NMVOC and NOx emissions have been falling since 1990, mainly due to the increased use of exhaust catalysts. However, this has been partly offset by the large growth in traffic volumes. Meeting the targets of the European Commission. s 1999 proposal for a Directive on national emission ceilings would require further emission decreases. Meet international emission-reduction targets (see Table 1.1). Annual air emissions of carbon dioxide (CO2), nitrogen oxides (NOx), non-methane volatile organic compounds (NMVOCs) and sulphur dioxide (SO2). Air emissions from transport contribute significantly to climate change, acidification, photochemical pollution (ground-level ozone) and poor urban air quality. Airborne pollutants have serious adverse effects on human health and ecosystems, and damage building materials. The Kyoto Protocol, under the United Nations Framework Convention on Climate Change (UNFCCC). Industrialised countries agreed to reduce their emissions of six greenhouse gases by 5 % from 1990 levels by 2008-2012. The EU is committed to a reduction of 8 %. In 1998 the EU Member States agreed a system of . burden. (or . target. ) sharing, allowing some Member States an increase in greenhouse gas emissions, while others are committed to larger reductions than 8 %. The protocol was adopted in 1997 and has been signed by many countries but since only a few have ratified it, it is not yet in force. The Protocol does not address greenhouse gas emissions from international marine and air transport. The Convention on Long-Range Transboundary Air Pollution, under the United Nations Economic Commission for Europe (UNECE/CLRTAP) and parallel Community initiatives, aimed at curbing acidification, eutrophication and ground-level ozone. Under CLRTAP several Protocols are in force for European countries, including the EU and its Member States, requiring reductions of emissions of SO2, NMVOCs and NOx, expressed as national emission ceilings or percentage reductions. The EU also has set targets within the 5EAP. In May 1999 the Commission presented a proposal for a Directive on national emission ceilings (NECD) for the same pollutants and also for NH3 (of which transport is not a source), which are stricter than the current agreed targets. The proposal has not yet been adopted by the Council. Parallel with CLRTAP, draft national emission ceilings for many European countries, including EU Member States, were agreed in September 1999 in a new multi-pollutant Protocol for these four pollutants. This Protocol was adopted on 1 December 1999 (UNECE, 1999). For most EU Member States the targets are less strict than those in the proposed Directive. The International Convention for the Prevention of Pollution from Ships (MARPOL): a new protocol to reduce pollution emissions (NOx, SO2) from ships was proposed in 1997, but this has not yet been adopted. Community legislation dealing with gaseous emission standards for aircraft are based on the certification standards for CO, NOx and HC set by the International Civil Aviation Organisation (ICAO). More stringent emission standards are currently being investigated by the Committee on Aviation and Environmental Protection (CAEP). The Commission has also announced its intention to complement ICAO NOx standards with other measures (CEC, 1999d). All the international emission reduction targets in Table 1.1 apply to total national emissions. Countries are responsible for allocating emission reductions to sectors, such as energy, industry and transport. Community policies to curb air pollution from road traffic have been framed around the Auto-Oil Programme I (which is now completed) and the Auto-Oil Programme II, with its proposed follow-up programme . Clean Air for Europe. (CAFÉ). At the Member State level, Austria (BMU, 1995) and the Netherlands (VROM, 1998) have introduced emission-reduction targets for NOx from both road and non-road transport (some 75 % reduction from 1985 levels by 2010). Targets for the reduction of NMVOC emissions have also been adopted (75 % reduction from 1988 levels by 2007 in both Member States. In the Netherlands the government has also adopted a CO2 emission reduction target for road transport (10 % by 2010 from 1986 levels). 1 The Kyoto Protocol (6 greenhouse gases: CO2, CH4, N2O, HFCs, PFCs, SF6). The 8 % reduction target applies to Community emissions total (Member State targets are different, as agreed in the 1998 EU burden sharing). 2 Target of the 1994 Second Sulphur Protocol, based on a 60 % gap closure of the exceedance of critical loads for ecosystems for sulphur deposition. This includes different emission ceilings for each Member State and corresponds to a 62 % emission reduction for the Community (EU15) by 2000, from 1980 levels. 4 Targets from the European Commission. s 1999 proposal for a national emission ceilings Directive (NECD). These are based on the approach of closing the gap between exceedances of critical loads for acidification and eutrophication of ecosystems and exceedances of threshold values for ozone for human health and ecosystems. The targets are different for each Member State (reductions presented reported here correspond to the EU15 emission reductions). 5 Targets from the multi-pollutant Protocol, adopted in December. The approach followed is the same as for the NECD, but for various EU Member States the draft CLRTAP emission ceilings are less strict than the targets in the proposed NECD (CEC, 1999a). 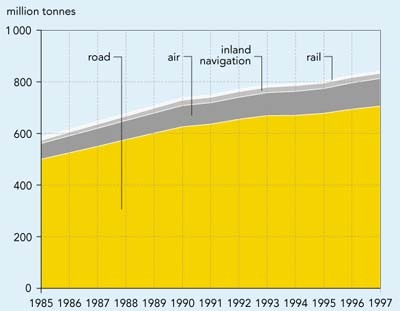 Emissions of CO2 from transport in the EU increased from 0.6 to 0.8 bn tonnes (30 %) in the period 1985-1996 (an increase from 20 to 26 % of total anthropogenic emissions). This makes the transport sector the fastest growing source of emissions. For comparison, the energy sector contributed 35 % of total emissions in 1996, and the industry sector 17 %. Road transport accounts for 85 % of all transport CO2 emissions. Aviation is the second largest transport CO2 source (12 %). The upward trend in CO2 emissions from transport is due to growing traffic volumes, as there has been very little change in average energy use per vehicle-kilometre (see Indicator 20). Since the Community target for greenhouse gases under the Kyoto Protocol cannot be allocated to CO2 only (see Table 1.1), nor to a specific sector, it is difficult to benchmark transport CO2 emissions against this target. However, the current trends and future outlooks are worrying. Projected EU CO2 emissions for 2010 based on the EEA. s pre-Kyoto baseline scenario (including only policies and measures in place in 1997) are about 8 % above the 1990 level (EEA, 1999). Emissions from transport are forecast to increase by 39 % above the 1990 level by 2010. This shows the need for further policies and measures to achieve the Kyoto Protocol target, for all sectors, including transport. 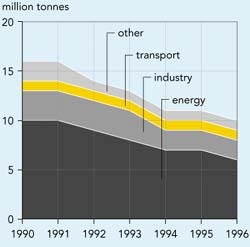 Emissions of NMVOCs from transport fell from 6.3 m tonnes in 1990 (45 % of total emissions) to 4.8 m tonnes in 1996 (35 % of the total). These reductions resulted from the introduction of catalysts on new petrol-engined cars and stricter regulations on emissions from diesel vehicles (see Indicator 21). Industry contributed 7 % of the total in 1996, the energy sector less than 1 %. The projected EU15 total NMVOC emissions from transport for 2010, based on a baseline scenario, are about 67 % below the 1990 level (EEA, 1999). Whether the current and proposed/draft targets for the EU Member States for national emissions will be achieved by 2010 will depend on the implementation of the policies and measures which have been adopted, by all relevant sectors (transport, industry, energy, households), and the introduction and implementation of additional policies and measures. 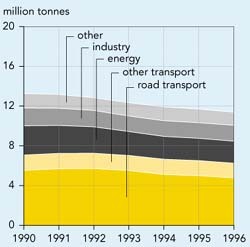 Emissions of NOx from transport fell from 7.1 to 6.2 m tonnes in the period 1990-1996, a 13 % reduction. These reductions resulted from the introduction of catalysts on new petrol-engined cars and stricter regulations for emissions from diesel vehicles (see Indicator 21). The contribution to total emissions increased only very slightly (from 54 to 55 %) over the same period. The energy sector contributed some 19 % of the total in 1996, the industry sector 14 %. The first CLRTAP Nitrogen Oxide Protocol target (stabilising to 1987 emissions by 1994) was achieved by the EU as a whole and by most Member States. However, the fifth environmental action programme target of a 30 % reduction by 2000 with respect to 1990 will not be achieved. The projected EU15 total NOx emissions from transport for 2010 based on a baseline scenario are about 43 % below the 1990 level (EEA, 1999). Meeting the targets of the European Commission. s 1999 proposal for a Directive on national emission ceilings would require further decreases of emissions from the transport and other sectors. 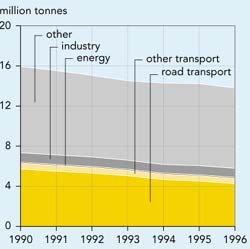 Transport contributed less than 10 % of the total SO2 emissions in 1996, the energy sector 62 % and industry 20 %. 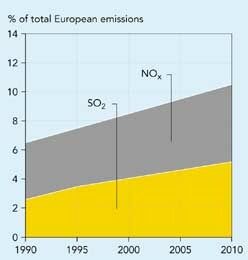 Total emissions of SO2 in the EU fell from 16.3 to 9.4 m tonnes between 1990 and 1996 (a reduction of 42 %). International ship traffic is responsible for most of the transport contribution to SO2 emissions, due to the use of very high sulphur content (around 10 %) fuels. Future actions to abate SO2 emissions from shipping our outlined in the Communication on the Development of Short Sea Shipping in Europe (CEC, 1999c). The contribution of marine transport to acidifying emissions is discussed further in Box 1.1. While the European Commission. s strategy to combat acidification (CEC, 1997a) recognised the cost-effectiveness of emission reductions from ship traffic compared with reductions of land-based emissions, shipping accounts for increasingly larger shares of acidifying emissions. In absolute values (1995 data), emissions of SO2 and NOx from international ship traffic were similar in magnitude to the contribution of individual large countries. International ship traffic sources account for about 10-15 % of total deposition over western Europe. If no further reductions are accomplished, the relative contribution of emissions from international ship traffic is expected to double by 2010. The cost of limiting the sulphur content of marine bunkers in the North Sea and the Baltic sea to 1.5 % (the maximum value accepted by MARPOL) has been estimated at about EUR 87 m per year. Equivalent reductions in total emissions from land-based sources (such as power stations) would cost about EUR 1 150 m per year. National reporting often provides incomplete time series for the period 1980-1990 and this data has therefore been excluded from this analysis. Data for the period 1990 to 1996 is more complete and presents fewer inconsistencies. The quality of the indicator would be enhanced by improved national reporting (in particular for the period 1980-1990 and onwards for some Member States and pollutants). National estimates should be better documented, so as to identify possible inconsistencies. Consistent estimation methods should be used by Member States for the complete time series. A simple, consistent methodology should be developed to compare national estimates with centrally produced estimates prepared for all Member States. The results of such comparisons should be communicated to Member States to improve the consistency, transparency, comparability and reliability of national estimates, and ensure that central estimates are converging with national estimates. Emissions of NOx by transport (as reported by Member States to international conventions and the Commission). 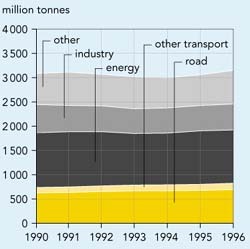 Emissions of NMVOCs by transport (as reported by Member States to international conventions and the Commission). For references, please go to https://www.eea.europa.eu/publications/ENVISSUENo12/page007.html or scan the QR code.